President Donald Trump swept through Southern Nevada in early April and spoke at the Republican Jewish Coalition annual membership meeting at the Venetian Hotel on the Las Vegas Strip, speaking about his recent actions on foreign policy with Israel and rallied for support of his 2020 run. Jeffrey Meehan/Pahrump Valley Times President Donald J. Trump addresses the crowd at the Republican Jewish Coalition at the group's annual membership meeting on April 6, 2019. Hundreds turned out to hear Trump, Vice President Mike Pence and others speak at the day-long event. (L.E. Baskow/Las Vegas Review-Journal) @Left_Eye_Images President Donald J. Trump waves as he readies to depart from McCarran International Airport on Air Force One on Saturday, April 6, 2019, in Las Vegas. He was in town addressing the Republican Jewish Coalition during the RJC's Annual Leadership Meeting at The Venetian. L.E. 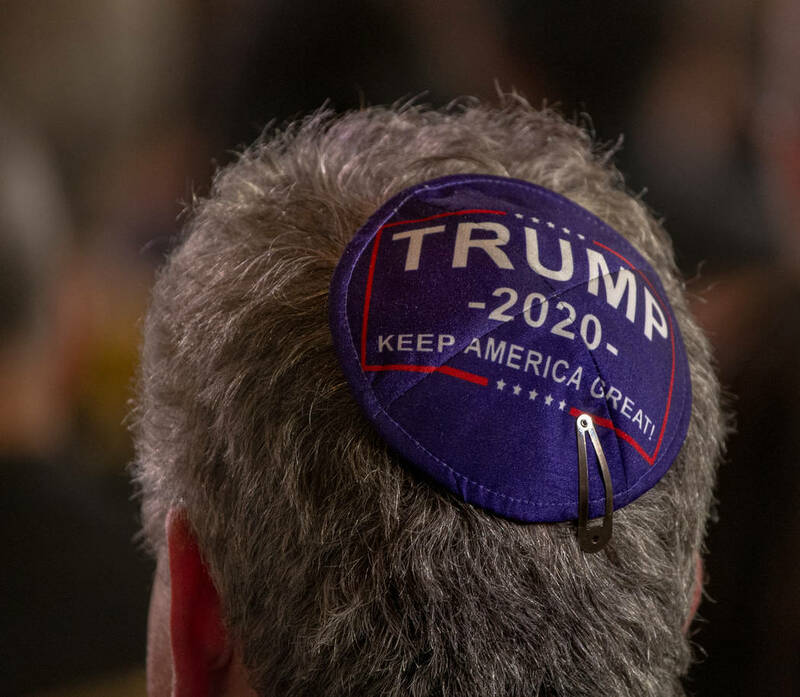 Baskow/Las Vegas Review-Journal An attendee wears Trump yamaka as President Donald J. Trump addresses the Republican Jewish Coalition during the RJC's annual leadership meeting at The Venetian on Saturday, April 6, 2019, in Las Vegas. (L.E. 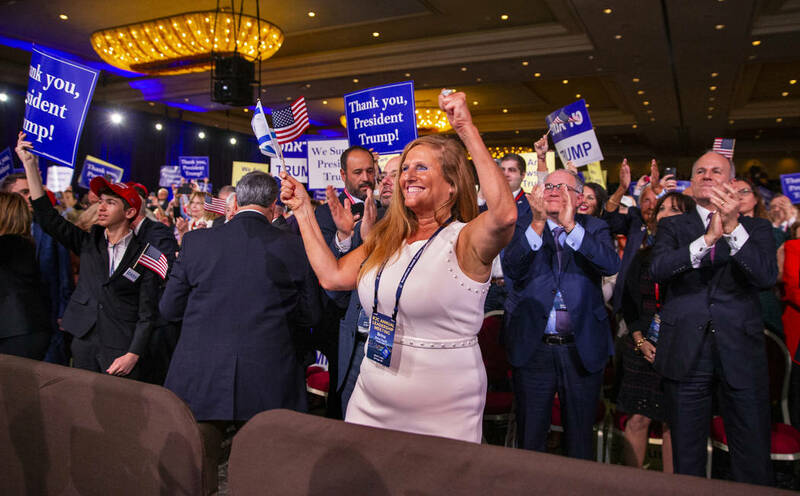 Baskow/Las Vegas Review-Journal) @Left_Eye_Images Attendees cheer and applaud as President Donald J. Trump leaves the stage after addressing the Republican Jewish Coalition during the RJC's annual leadership meeting at The Venetian on Saturday, April 6, 2019, in Las Vegas. (L.E. 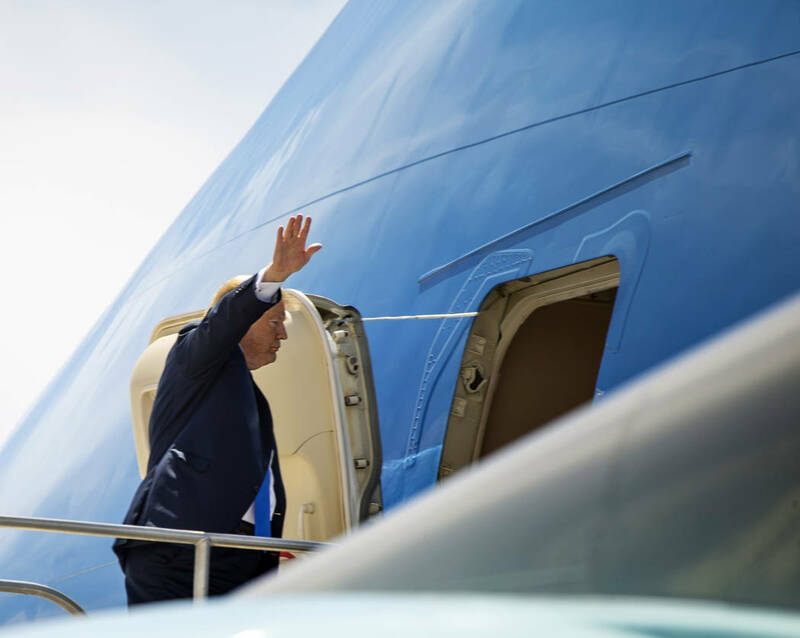 Baskow/Las Vegas Review-Journal) @Left_Eye_Images President Donald J. Trump departs from McCarran International Airport on Air Force One after addressing the Republican Jewish Coalition during the RJC's Annual Leadership Meeting at The Venetian on Saturday, April 6, 2019, in Las Vegas. 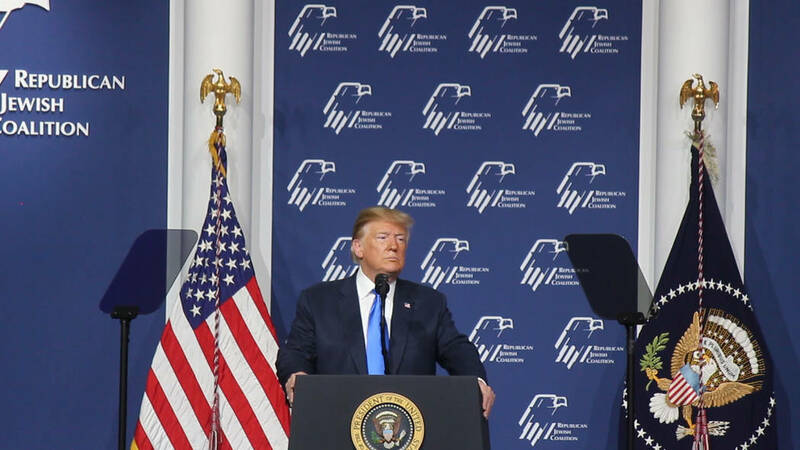 Hundreds of attendees at the coalition’s event cheered on as Trump spoke of his pro-Israel policies and touted his agenda for border security, trade deals and other topics during a roughly 60-minute-long speech at the coalition’s meeting on Saturday. Trump also proclaimed that Republicans would make major advances in the 2020 election cycle as many in the crowd waved signs of support. Trump garnered roughly 24 percent of the Jewish vote in the 2016 election cycle, according to a preliminary analysis by Pew Research Center just after the election. In Nye County, support for Trump was higher than that with 68% of voters in the county picking Trump over then-candidate Hilary Clinton in 2016. Overall, Clinton won the majority vote in Nevada. Since taking office, Trump has made several moves to take a different direction on decades of U.S. foreign policy with Israel. One of those actions was moving the American embassy to Jerusalem from Tel Aviv, with the U.S. recognizing Jerusalem as the capital of Israel. Along with that action, also breaking away from decades of U.S. foreign policy, Trump recognized Israel’s sovereignty over Golan Heights. Golan Heights sits between Syria and Israel. Israel captured the region in 1967 during what’s known as the Six-Day War between Israel and Syria. President Trump has received several accolades from leadership of the Jewish Coalition as being pro-Israel. Owner of the Las Vegas Review Journal and chairman and CEO of the Las Vegas Sands Corp. Sheldon Adelson, said “he found Trump’s speech ‘very inspiring,’” a report in the Review Journal stated. Trump also touted his record on what he said boosted the economy and his call for more military spending and spoke on other subjects, including border security and other topics. Vice President Mike Pence spoke in the afternoon session of the coalition’s meeting, following up with support of the pro-Israel agenda that the president has enacted. Pence also spoke about the recent finding by special counsel Robert Mueller in the Russia investigation that there was “no collusion” during the 2016 election.